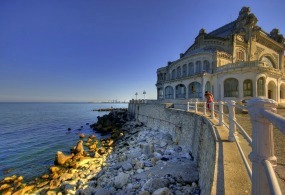 Book now the best shore excursions in Romania. High quality and safety at the lowest prices. If your are looking for the best Shore Excursions Romania, book now the best guided tours at lowest price with Ancora Tours. Since 2003 we offer you official guides in english, transportation and travel insurance, all included. The highest quality at the lowest rates. Since joining the European Union in 2007, more and more tourists have ventured to Romania. Bordered by Bulgaria, Serbia, Hungry, Moldova and the Ukraine, the country boasts scenic mountain landscapes and wild countryside. Bran Castle in Transylvania is known worldwide for its association with Dracula, this forested region provides a backdrop for other pursuits such as hiking, climbing and bathing in the natural thermal spas. If you’re looking to try local cuisine, the food on offer is a mix of influences from around Europe. You’ll find dishes similar to Greek Moussaka, Austrian Schnitzel and Turkish meatballs to name just a few of the specialties on offer.